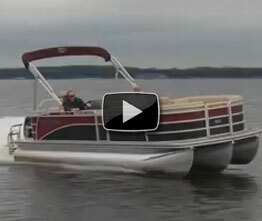 Our Boats.com Video Boat Review Team took to the lake and checked out this 24 foot pontoon boat. Growing up, my lake was filled with pontoon boats. Circling the shore each evening, or rafting up in one big party on the weekends. Back then a comfortable seating area was about all you needed. But today's buyer demands a lot more. 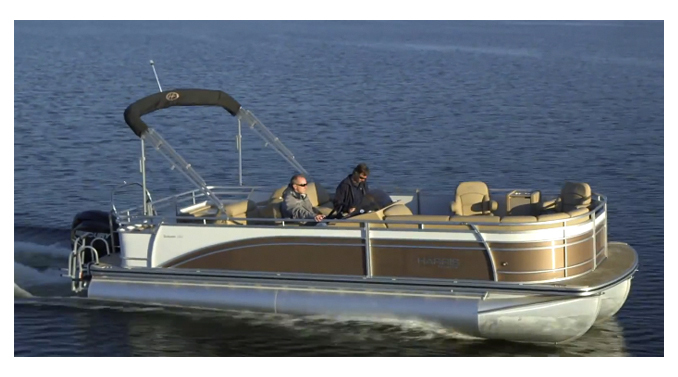 They want speed, performance, even the ability to tow skiers and wakeboarders. 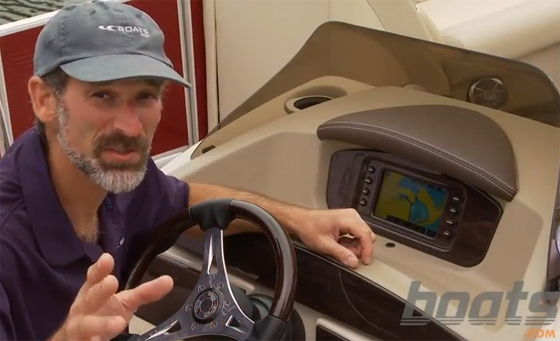 How does Harris FloteBote's Sunliner LS 220 fit into that equation? It's not really pontoon boat weather, but I'm gonna go find out. 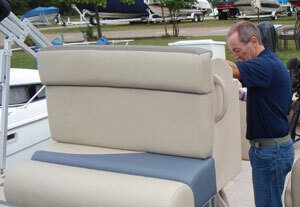 Don, this Sunliner features the Luxury Series upgrade. Now what does that include? Don Mason, Harris FloteBote: That includes a larger helm stand, more ergonomics, you get a different foam pack in the seats, fully vinyl-covered rotocast, you get an upgraded helm seat to the luxe helm seat. You get a different graphics package in the insert in the seat itself. You get docking lights standard with the boat. We've added styling cues to the fence and additional bars to help set it apart, give it a different graphics appearance. Now what kind of customer typically chooses that? Don: Someone who's looking for a little bit upscale over the standard Sunliner, a nicer looking package, but yet still at a reasonable price. LS upgrades aside, there are some nice features on the Sunliner that borrow from the brand's higher end models. Take this exterior railing. 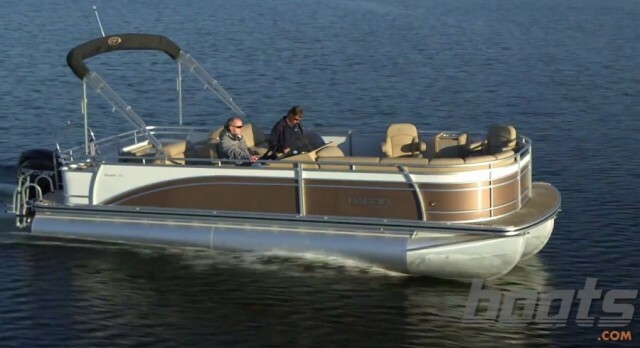 Rather than the typical boxy squares that give a pontoon boat its boxy look, they've given it some nice flowing lines that give it a lot of style. Fence panels come all the way to the top, which covers the vinyl and eliminates any gaps. There's an attractive fiberglass helm with room for a cooler below, although I did miss the clear forward view provided by the raised helm position on higher end models. I'd suggest the optional adjustable height seat, both for visibility at speed and the enhanced feeling of control it provides during low speed maneuvering. There's ample seating throughout for a large crowd. Vinyl is formulated with Prefix, which helps resist stains, abrasion, also UV rays. Below, rotomolded seat bases provide a low maintenance finish for all the gear you'll bring aboard. 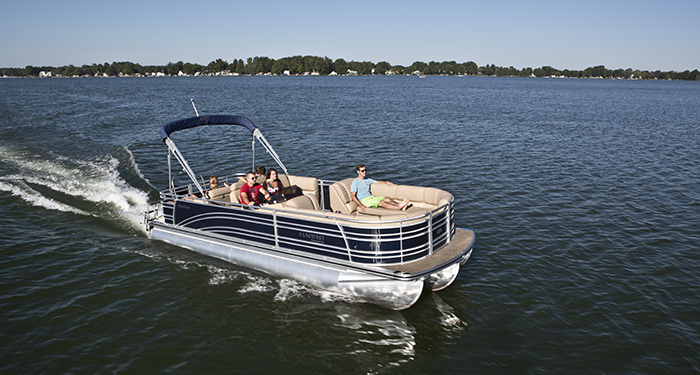 Aft, this rear facing lounger is an option, but it's a great place to keep tabs on skiers and wakeboarders or just relax. As it's within the fenced perimeter, passengers can safely sit here. Although it does limit the traditional social space up front. Included in this option is a rear swim deck. Choosing the aft lounge doesn't do away with the typical popup changing room. It's moved here to the entry way, and it still provides a place to put on swim suits or answer nature's call if you add the optional portapotty. This beefy towbar will more than handle the day's towing duties. Underneath the deck, Harris trademark construction is above average. Cross members are spaced every sixteen inches, rather than the industry standard which would be 24 inches. I also like the use of full length M brackets to attach the pontoons to those cross members. A lot of manufacturers might use segmented parts on the inside, where it's out of sight. 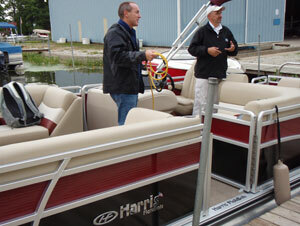 My test boat was optioned to include Harris' P3 performance package. It adds a third central tube dropped one inch below the outer tubes to give the boat the handling characteristics of a fiberglass v-hull. Lifting strakes are added to the outside of the exterior tubes and both sides of the central tubes to lessen planing time. Below deck skirting covers up the cross members to lessen resistance. Top speed with a relatively modest Mercury 150 was 35 mph. Like a lot of pontoons, fuel consumption is relatively linear; at a comfortable 20 mph cruise, I achieved just under 3.5 mpg. 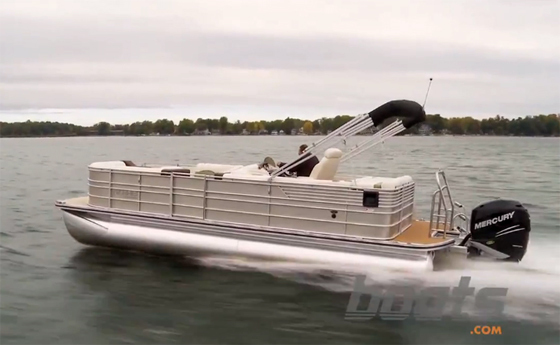 Make no mistake: the LS 220 stays true to the idea of a party barge. I've got seating for all my friends and then some. But I've also got the speed, handling, and towing ability to make the boat much more than just a party platform. That's a combination I think a lot of buyers will appreciate.